There will be a celebration of Russell Faure-Brac’s life on Saturday, July 11, at the Bolinas Community center from 1 to 4 p.m. Guests have been asked to bring their favorite desserts and memories of Russ to share. A onetime Defense Department engineer, Mr. Faure-Brac became a peace activist during the Vietnam War. He died May 20 at the age of 71 in the Dogtown home he and his wife Anne Sands shared. She is the coordinator of the West Marin Disaster Council. Russ with a MaiTai in Maui a few weeks before he died. 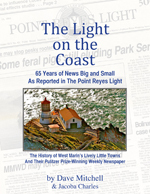 “After receiving a master’s degree in Engineering Economics from Stanford University, he worked for SRI as a weapons systems analyst, applying statistical models to death tolls from the Vietnam War,” The Point Reyes Light reported. “In 1968, when he saw the disparate valuing of U.S. lives ($50k) vs Vietnamese lives ($0), he underwent a crisis of conscience and resigned in protest. “The film But, What Do We Do? (click here to see) documented Russ’ decision to leave the defense industry, to pursue the teachings of Gandhi & Martin Luther King at Joan Baez’ Institute for the Study of Nonviolence, and to participate in the Peace Games, an immersive event that explored nonviolent approaches to a hypothetical Soviet invasion of Northern California. Members of Russ Faure-Brac’s family (from left): Gabe Faure-Brac and wife Megan Fromer of Stamford, NY; Anne Sands and Russ Faure-Brac; Josh Faure-Brac and “main squeeze” Catherine Wood of Los Angeles. The main focus of his post-defense industry work was the founding of an environmental consulting firm. However, after the “9-11” attack on the World Trade Center in New York, Mr. Faure-Brac returned to his peace activism, developing a project he called Transition to Peace (transitiontopeace.com). He wrote a book of the same name, gave talks on the subject, and hosted a program on KWMR, the West Marin community radio station. Many residents along coastal Marin knew him for his “defense engineer’s search for an alternative to war,” as he described his later-in-life journey. I was wondering if this was something you had personally heard of. I’ve come across the story multiple times but can’t find anything on the internet so I may be myth busting and something told me you may be the person to ask. Thank you so much. I look forward to looking through your blog more. Sparsely Sage and Timely is powered by	WordPress 4.9.10 and delivered to you in 0.390 seconds using 54 queries.